At home, Ellie, Atlas, and Aspen are used to being able to go into their kennels when we’re relaxing. While camping, we’ve always had blankets they could go to to curl up & sleep, but after using the Alcott Mariner Shade Canopy, we received from Alcott I doubt we’ll ever be found camping without it. While the canopy was a little too small for Atlas but Ellie & Aspen found comfort in having a covered area to go to without feeling fully secluded. They were able to stay cool, and rest comfortably for our next adventure up the mountains. The Shade Canopy is designed just like a pop-up tent. It comes inside a nice carrying bag with three collapsible poles, a nylon shade cover, four small ground stakes, and a thin tarp as a base, which can be detached by simple plastic buckles at each corner. The canopy was designed for use on the beach, but can easily be used while camping, although it may be slightly less durable on solid ground with rocks & roots versus sand at the beach, and may wear through quicker. We unfortunately don’t have any true beaches anywhere close to us anymore due to rising water levels in our lakes and were only able to test while camping. The Shade Canopy only comes in one size and one color. As for size, it measures in at 2.75 ft x 3.5 ft at its base, and stands at 2.5 ft tall. 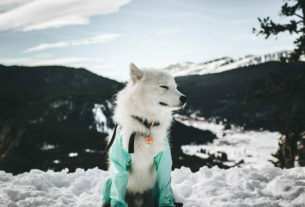 It fits a dog up to about ~40-45 pounds comfortably. Atlas, who is 47 lbs, was too big to lay down without having his hind end and head hanging out each side, and definitely couldn’t sit comfortably. Ellie & Aspen, who are each right around 37 lbs, fit perfectly with just a little room to spare. 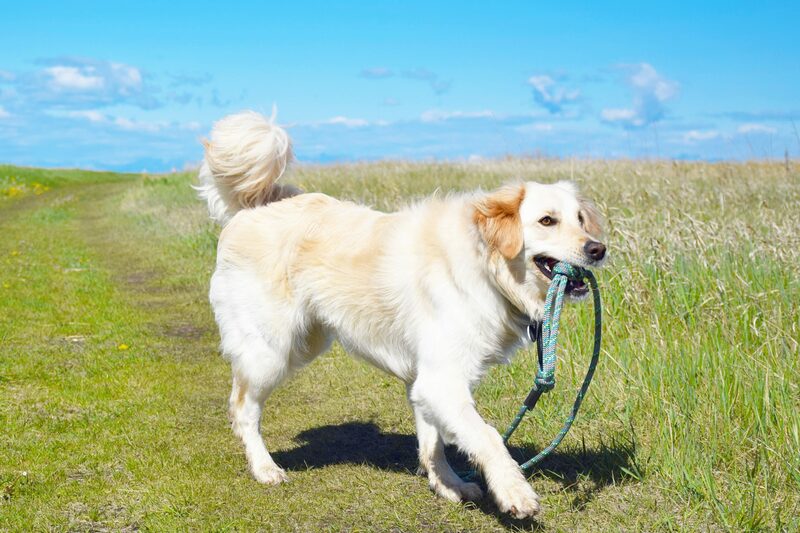 Ideally, both a larger and smaller size should be offered for dogs who are in those smaller or larger ranges. 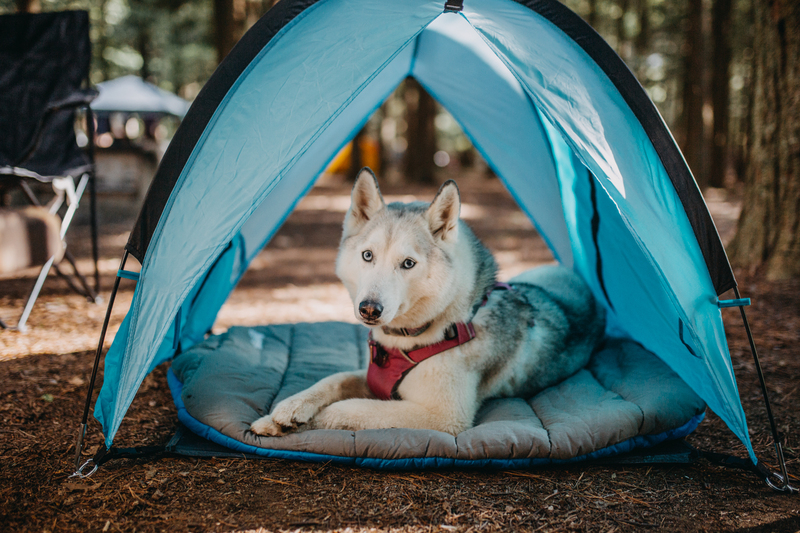 There is currently no way a dog over 50 pounds could comfortably fit into the canopy, but smaller dogs may still find comfort in having some shade and extra room. Setup is a breeze if you’ve ever used a pop-up tent before; if not, it may take an extra minute, but directions are easy to follow. It’s as simple as connecting the poles, sliding them through the pockets at the top, and sliding the ends of the polls over the metal prong on each corner. You can use the ground stakes to hold the canopy in place if it’s windy, but the stakes are too flimsy to be used in the ground (should be fine to use in soft sand); we ended up bending two of them right off the bat when trying to put them in despite being very careful. While color options aren’t truly a necessity with the Shade Canopy, it does only come in one color: blue. Generally speaking, lighter colors will help avoid attracting & trapping heat within the canopy, so the light blue color that Alcott chose seems to be a good choice. Offering other color options such as a light green, or even yellow, could give owners the option to coordinate with their own tent or canopy. I’d love to have a second green one to match our tent! 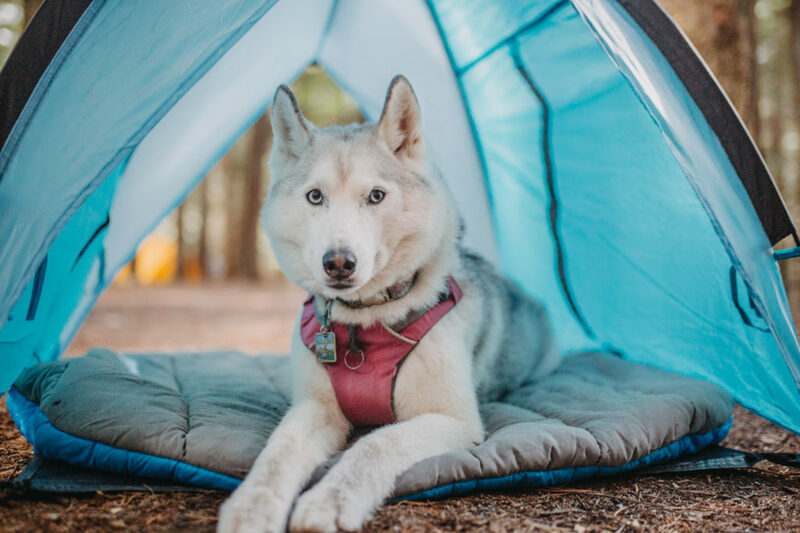 If you’ve ever used the Alcott Explorer Pup Tent (or any similar small tent for your pup), you may have had the issue of the tent becoming too warm inside when in direct sunlight. The great thing about the Shade Canopy is that it’s completely open on two sides, and the other two sides have the ability to open via a zipper up the middle, and each side can be held open with a quick tie. This option is extremely helpful when the sun is directly overhead, while still allowing for airflow. 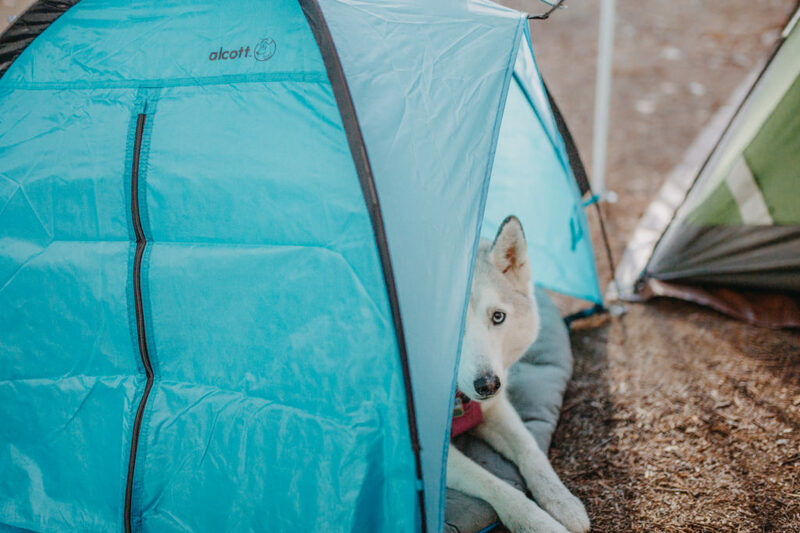 Overall the Alcott Shade Canopy is an excellent option for dog owners who want to give their dogs an extra little den to go to while camping or at the beach. 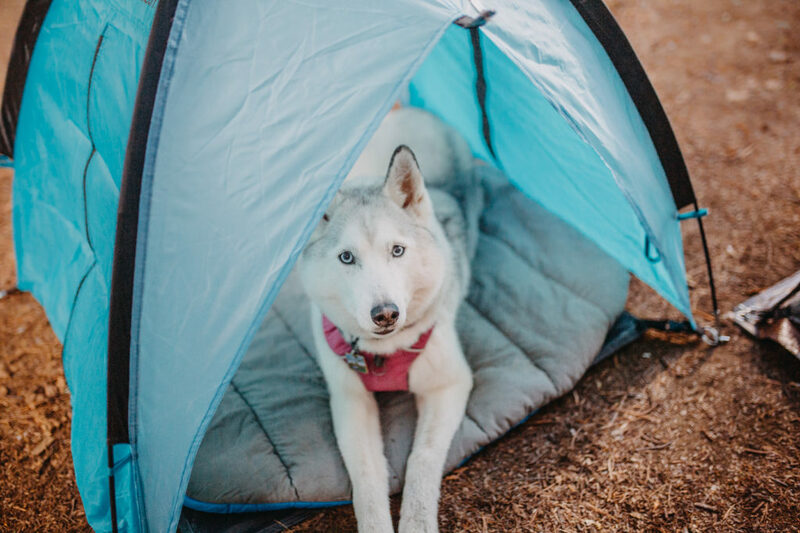 The ability for air to flow freely through it gives it some benefit over the pup tent in keeping your dog cool on warm days. At $29.99, you really can’t go wrong with how easy it is to put up, and how lightweight it is. Maybe just remember to switch out the stakes for some stronger ones if you plan to use while camping. 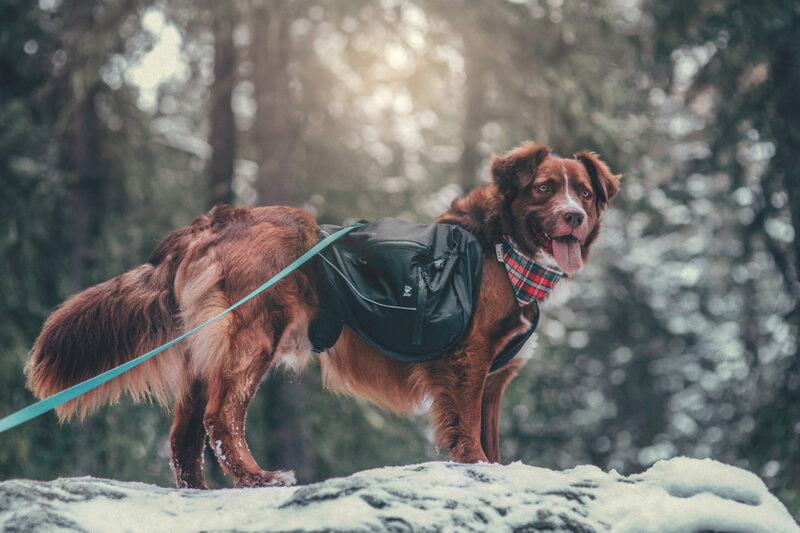 This product is best for: Dogs under 45 lbs, dogs who like to have a “den” to go to while camping or at the beach, while still offering airflow to stay cool during warm days. This product may not be ideal for: Large dogs over 45 lbs. Do you think this would be good as a beach shelter? My dog loves snoozing on the beach, but gets too hot without any shade and the cheap umbrella I bought is breaking. The original intention of the shelter is for the beach so it would work just as well, if not better, than it did for our Trail Tester.